If you want to incorporate garland into your Christmas décor, there are plenty of low-cost and easy DIY ways to go about it. I am going to show you the easiest and most budget friendly Christmas garland ideas. I enjoy decorating the exterior of my house for Christmas more than I do the inside. Something about coming home in the evening to see the festive lights greeting me, just makes me smile. It does take some effort, but when it’s all done, outdoor Christmas garland adds a nice, welcoming touch for the holidays. We don’t see as much snow here at the lake house, but my previous home in Pennsylvania did. 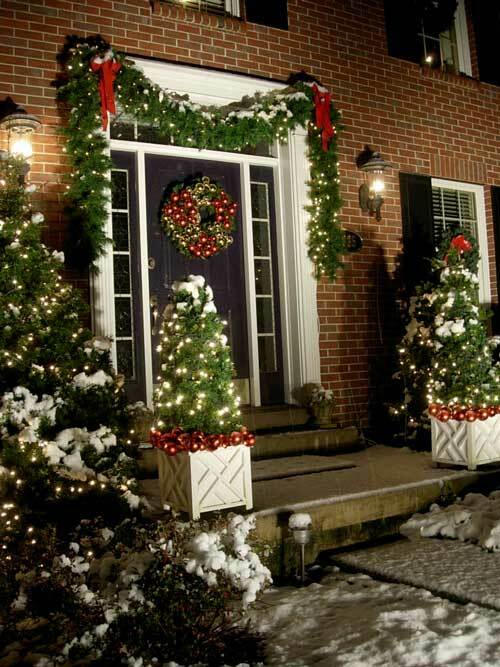 Christmas garlands draped over doors and porch railings tie all the festive holiday touches together. If you want to incorporate garland into your Christmas décor, there are plenty of low-cost and easy DIY ways to go about it. When I used to work for Macy’s as a visual merchandiser, I remember they would hold a visual sale to clean out the prop rooms. I could get a big Christmas garland for over my front door for $5.00, wreaths for the windows were just a few dollars. They would be full and fluffy and were not your average run of the mill decorations. Even if you don’t work at a department store, you can always ask friends and family if they happen to. Or, you can call up the stores directly and speak to the visual manager. If you can’t get your hands on decorative Christmas garland worthy of a Macy’s display, I have a few easy DIY tips for creating your own so you can add your own touch. The garlands that are sold at craft stores can be easily spruced up by wiring a few together to create one thick one. Add a few different types of garland, (some with pinecones attached, holly, or plain) together for a more natural look. Then fluff, fluff, fluff. 3 faux garlands will make one nice full fluffy one. Use florist wire to attach them. Lay out all the garlands on the floor so they are stretched out. Bring one end of each garland in your hand and then secure them together with florist wire. Twist the florist wire ends together to secure. Repeat on the other end. Along the center of the garland, take one small branch from each garland the use the florist wire to attach them. You don’t want the wire going over all the garlands, just choose a few sprigs and places along the garland to attach so that you have one larger garland. Christmas garlands with a collection of 3 tied together large ornaments add a nice texture and color pop to otherwise wimpy garland. 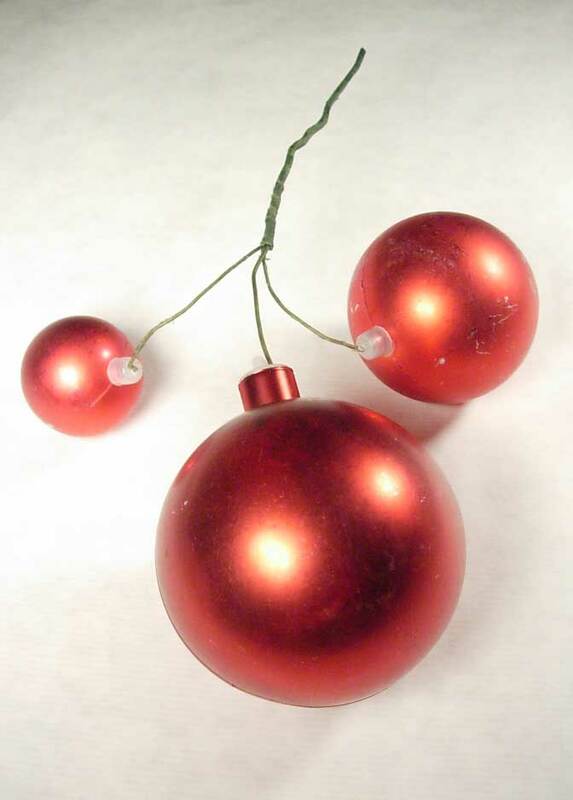 To tie 3 ornaments together to create more impact, remove ornament cap. Cut a 12″ length of heavy gauge wire and bend 2″ from one end into an L shape. Thread the bent end through cap and then into the ornament. Push cap back into place. The bent end of the wire will keep the wire from coming out of the ornament. Use three different size ornaments for more interest. Twist the wires together and wrap with florist tape. 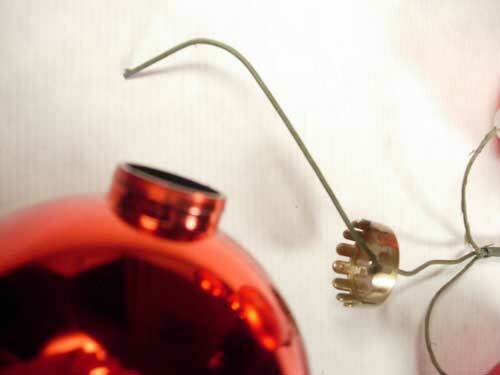 The heavy gauge wire lets you mold the ornaments exactly where you want and they will stay in place. If you don’t want to make your own ornament filled DIY Christmas garland, you can buy them at Pottery Barn. I used to work at a large Dept. store…now it’s Macy’s…and one year was able to score 2 of the prettiest bows… 30 years later, I still have them. Thanks for the tips! Diane, Thank you for sharing! I too, am ‘wired’ that way for decorating and seem to have a gift for it! You truly are an amazing lady. Here’s wishing you every success in everything you do! Have a wonderful holiday season 2014!